Plan 30 dager (Plan 30 dias) - Teposene kommer løse uten eske, men med individuell innpakning. Kommer som 60 teposer som er pakket individuelt. Også kjent som Tea Guarani. Plan 30 Dias kommer fra Paraguay og blir brukt som en slankekur. Folk spesielt fra Paraguay, men også fra flere land i Sør-Amerika, drikker Plan 30 dias for å gå ned i vekt. Hver pakke inneholder 60 teposer med en urteblanding som skal drikkes to ganger per dag. Urtebehandlingen hjelper for rensing, detox og vektkontroll. 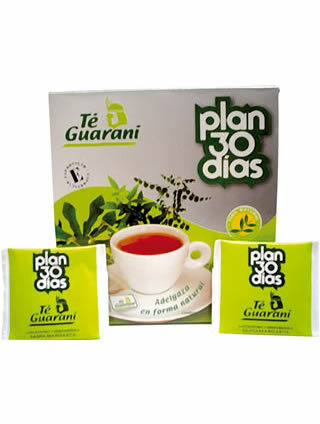 Is a tea which is elaborated with herbs with laxative and diuretic actions. It is a valuable help in the treatment of obesity based on botanic therapy. Its soft laxative and diuretic actions assist the elimination of the uric acid, fat and liquid excess that are in our organism, and therefore produce a natural and healthy thinness. The results can be even better when complemented with jogging and muscular and breathing exercises. Soon after the beginning of the treatment the body weight returns to normal, regular overweight symptoms disappear and the organism’s balance is reestablished. Its use is recommended in thinning treatments, in obesity control and in the maintenance of the body weight. It also works as a laxative and a diuretic.